Then we come to the Segments page. Here the CourseBuffet Degree Path is divided up in to 10-13 segments. Each segment has a short description and total credits needed for completion. Like most US universities the CB path has Core Courses. These are course that everyone has to take for the area of study they have chosen. Usually there are 7 to 10 core courses. Additional Courses are those that build on the path’s core and are higher level courses. Other segments either are related to the path’s area of study or are more general requirements that most bachelor’s degrees have. Click on a segment and you see all the specific requirements. 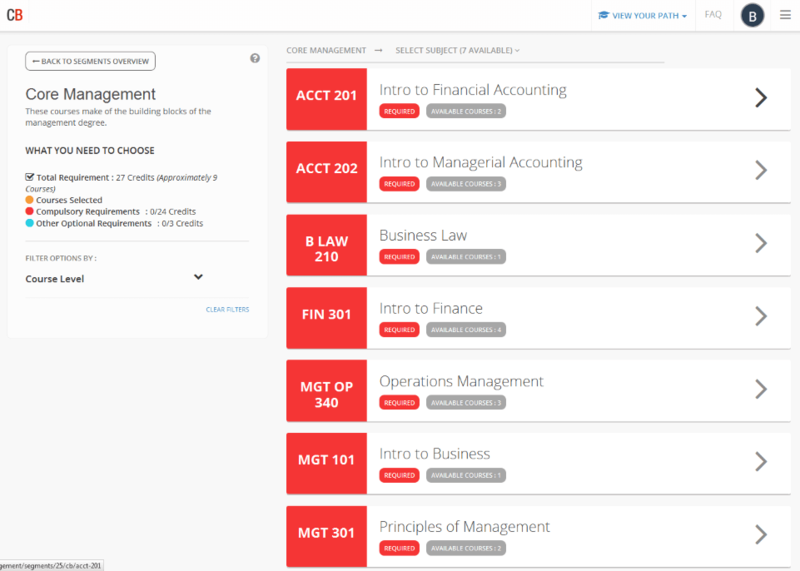 CourseBuffet organizes all courses under CourseBuffet Titles. 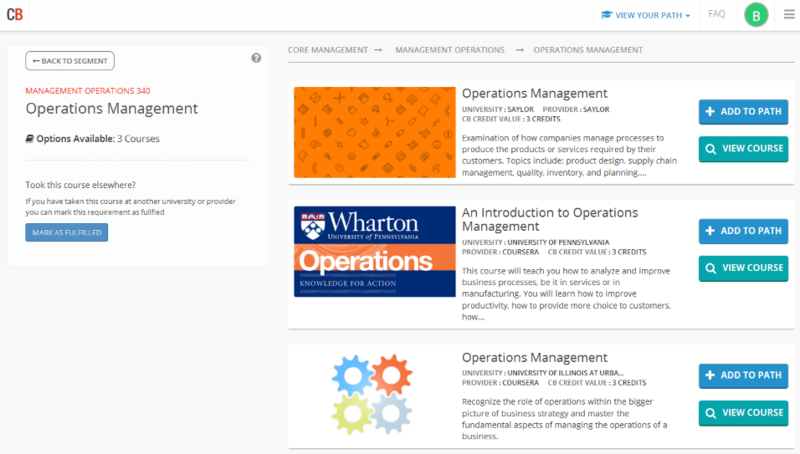 These allows you to know which courses cover similar material even if they have different names and are from different universities/platforms. See our FAQ for more about CourseBuffet Classification. Compulsory requirements are in Red. Optional requirements are in Blue. If a segment has optional requirements it means you will have to take some of these courses but you have some choice from options you are given. When looking at the Electives segment not all CB Titles may fit on the page. Here you can click on the subjects to see all your available options. When you click on a CB Title you then see all the courses available. 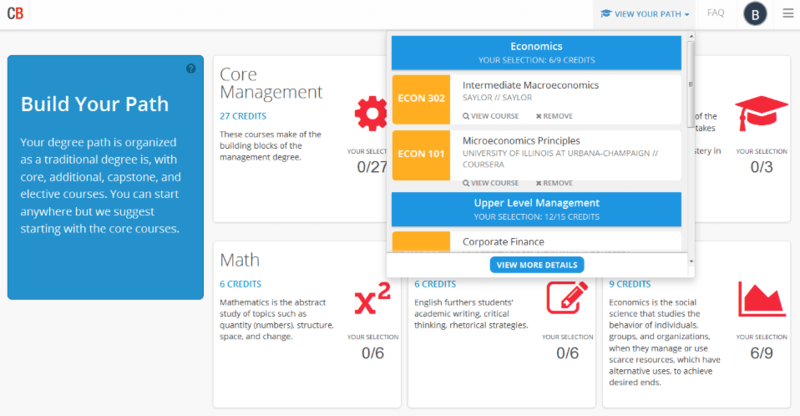 It shows you our estimate of the credit value for each one and who offer the course. Our estimate of credite value do get adjusted from time to time. You can add a course to your path. If you have already taken a course from a source not listed that would fit under a CB Title you can select "MARK AS FULLFILLED" and enter information about the course. 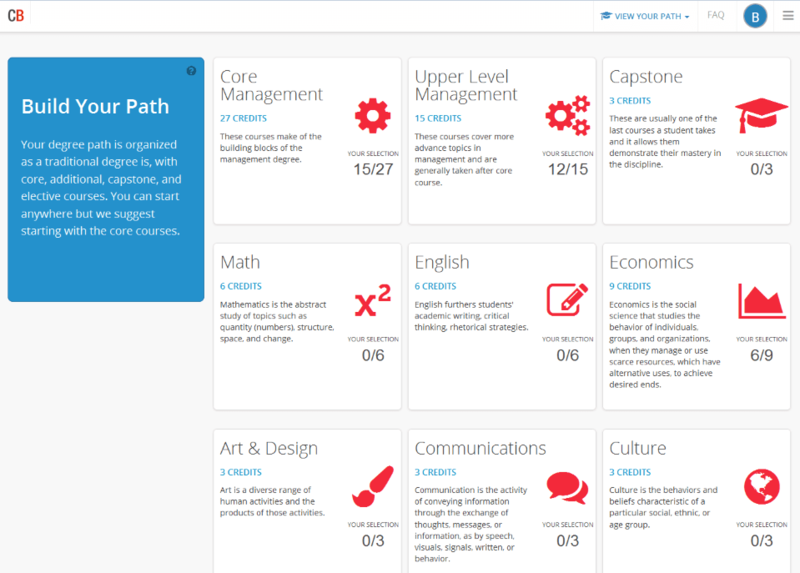 You can see a quick overview of all the courses you have selected by clicking on view your path. Select view more details to see the full transcript. CourseBuffet Degree Paths are very much are very much a beta product. We think it will provide tremendous value for our users and will help further the exceptence of low cost online education.